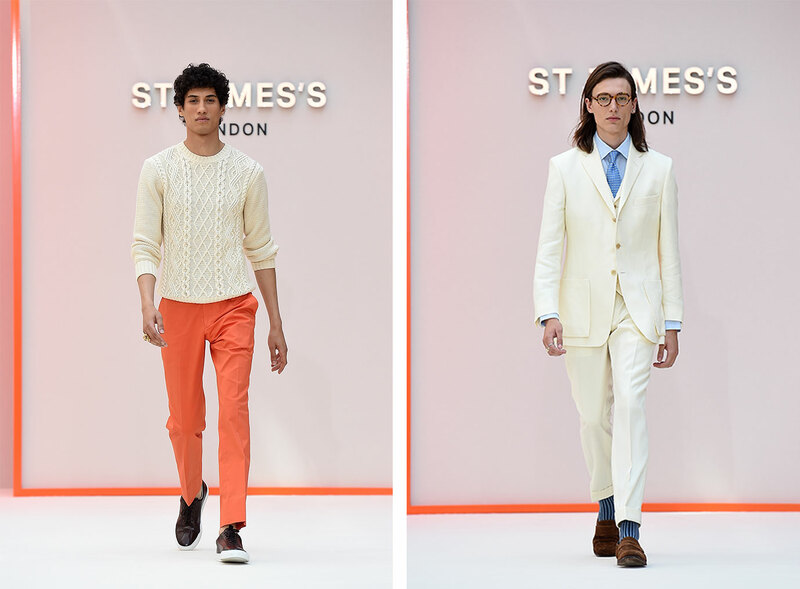 A highlight for me of this month’s London Fashion Week Men’s was the St James’s catwalk show in Jermyn Street. 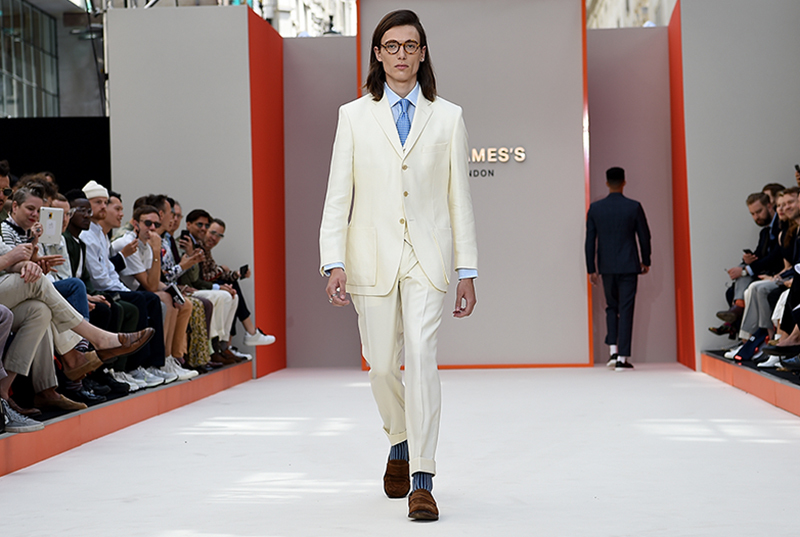 Unlike most fashion shows, this one is open to members of the public and many were drawn by the thumping music and spectacle of a show which displayed some of the best of British menswear from around this famous London street. 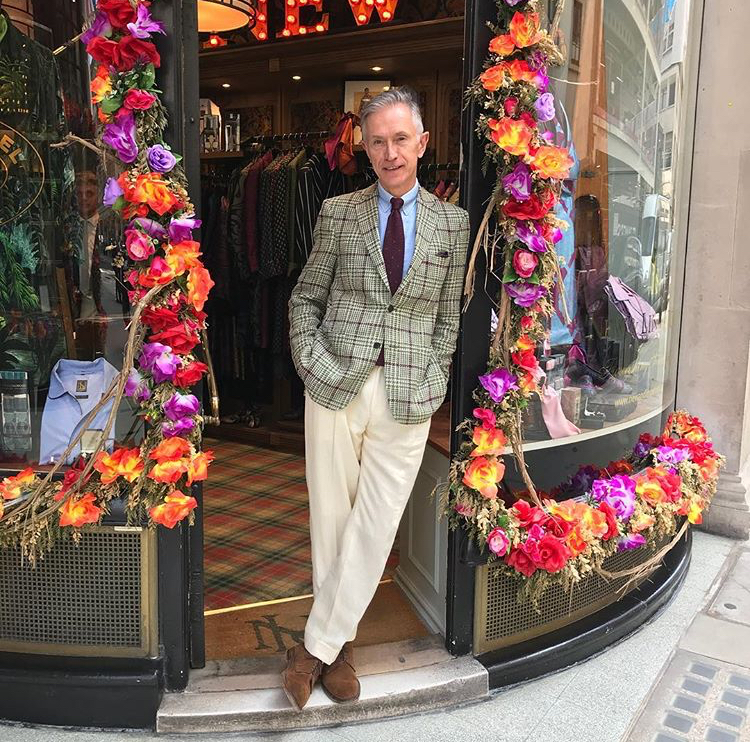 For the fourth year in a row, New & Lingwood took part, displaying clothes immediately available for purchase in their Jermyn Street store and online. Their shop offered the additional attraction of complimentary cocktails made from Portobello Road Gin as well as a free pocket square or tie with purchases over £250 and the chance to enter a draw for a pair of chinos in a wide choice of colours. The excitement of the show was given additional glamour by the crowds visiting the street after the nearby Queen’s Birthday Parade and a flypast by the Battle of Britain flight and the Red Arrows. But for those there for the menswear, the show didn’t disappoint. New & Lingwood’s Edmondton suit in luxurious cream linen brought Cary Grant-style glamour with its perfect touch of contemporary summer cool. A second, more casual, look added a splash of colour with orange Vaughn stretch cotton chinos and cream Aran cable knit crew neck jumper. For me these two looks personified N&L’s very current yet classic style. 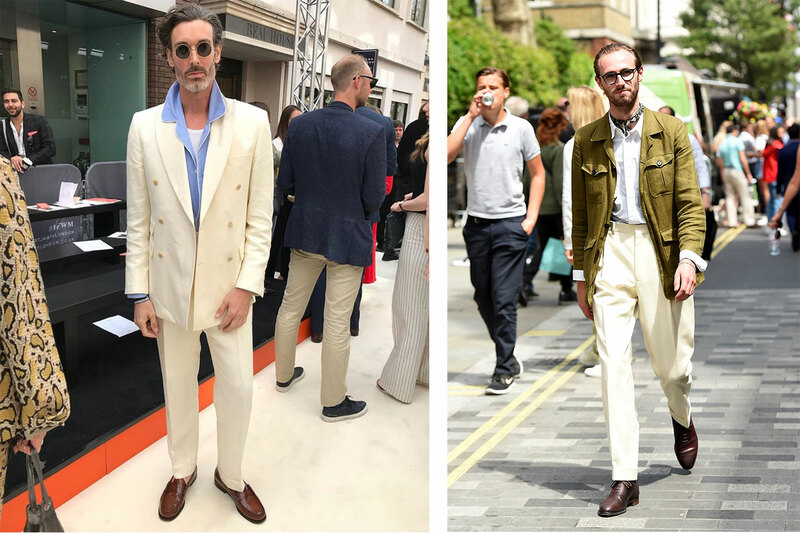 The trousers are cut with a little room, no skinny fits here, and the cut of the suit jacket and the colour of the chinos add more than a touch of individuality. The choices offered by N&L enable a man to dress soberly or with a touch of the dandy, as he prefers, yet there is something very identifiable about the N&L look. It was good also to see N&L being worn by some of the dapper men visiting the show. 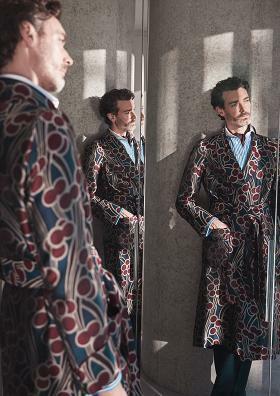 This shot of model Richard Biedul front row shows him in a double-breasted Edmondton suit worn with a pyjama shirt - a boldly individual yet comfortable style for the warm weather. The outfit which I chose to wear on the day perfectly illustrates this N&L mix of contemporary and classic. The Paterson check jacket is, I think, one of their outstanding pieces of the season. 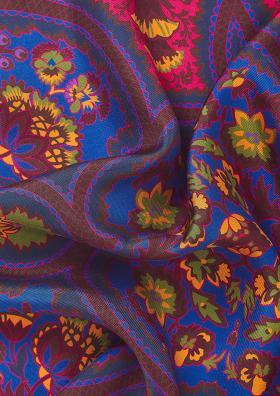 Made from a gorgeous 83% silk and cotton mix, it’s half-lined, making it ideal for summer wear. It adds a touch of British glamour to a warm summer’s day wherever you may be in the world. The silk knitted tie and Edmondton linen trousers completed my look. The trousers give a touch of summery vintage while keeping me cool and comfortable. I look forward to the next St James’s Catwalk Show and to seeing what N&L have to offer for the next season.